Nov. 2, 1936, launches a new era in Canadian broadcasting. It's the first day for the Canadian Broadcasting Corporation, which replaces the Canadian Radio Broadcasting Commission. The CBC is an improvement on its predecessor, says chairman Leonard Brockington in this clip welcoming listeners to the CBC two days after its formal establishment. At the first meeting of the corporation's governors, the ideas and ideals discussed were "almost as numerous as apple blossoms in the Annapolis Valley or peach blossoms in the Okanagan." Of the 74 radio stations in Canada, the CBC owns three and leases four more. Private or public, virtually all are dwarfed by more powerful American stations, and it will be a challenge for the CBC to ensure Canadians can hear their own station. Time zones are another obstacle for CBC programming. "The lady of the house in Halifax is often busy with her domestic tasks before the gentleman of the house in Vancouver has finally settled down for the night," says Brockington. • Born in Wales in 1888, Leonard Brockington immigrated to Canada in 1912 and worked as a lawyer in Calgary. In his book The Microphone Wars, Knowlton Nash describes Brockington as "Canada's best-known after-dinner speaker." • The CBC's predecessor, the CRBC, lasted less than four years. It went on the air in 1932 but regular programming didn't get underway until February 1933. • The CRBC began with two hours weekly of national broadcasting but within months it was up to one hour nightly. • Attacks on the CRBC came from many sources. Various anti-French groups (including the Ku Klux Klan) strenuously protested the CRBC's national bilingual programming. Having lost their station licenses years earlier, the Jehovah's Witnesses also held a grudge against public radio. • Other critics sneered at the "syrupy crooners" and "trash and jazz" that made up the CRBC's musical programming. "There isn't a laugh in the whole evening," said another, complaining about a lack of comedy. • One of the greatest achievements by a CRBC reporter was J. Frank Willis's coverage of the Moose River mine disaster in April 1936. Every half-hour for 56 hours, Willis reported to 58 Canadian radio stations and 650 U.S. stations on the efforts to rescue two men trapped in the mine. • Another big story carried by the CRBC was the 1934 birth of the Dionne quintuplets in Callander, Ont. • The CRBC's demise ultimately came because of evidence it was subject to the whims of the ruling government. • During the 1935 election, the CRBC ran sketches featuring the ruminations of "Mr. Sage," a philosophical geezer who explained to his naïve young friends why not to vote for the Liberals and Mackenzie King. Eventually the truth emerged: "Mr. Sage" was sponsored by the Conservatives and created by a Conservative ad agency using CRBC resources. • After the Liberals won the election, Alan Plaunt -- who by then had become a vocal critic of the CRBC -- lobbied strongly for a new public broadcaster. • Another parliamentary committee was appointed in spring 1936 to hear submissions on what should replace the CRBC. • In the end, the committee's report recommended keeping a public broadcaster and giving it regulatory powers over all radio stations in Canada. Licensing and allocation of frequencies were controlled by the federal government. • When the CBC went on air on Nov. 2, 1936, it had 132 staff including 10 producers and 14 announcers. • There were six hours of network programming daily, and CBC transmitters reached 49 per cent of Canadian households. There were radios in one million Canadian homes. • In its first year, 70 per cent of the programming on CBC consisted of music. Elettra Marconi, daughter of the inventor, visits Newfoundland for Marconi centennial celebrations. TV broadcasts now come in all shades of the rainbow, but colour TV sets are a luxury. From Signal Hill to Parliament Hill, radio's presence in Canada evolves from experimental to essential. A creative, keen young staff brings a "loose, wide-open feel" to CBC Television in its early years. Radio pioneers remember primitive studios and build-it-yourself radios. CBC Radio reporter Bob Bowman shares his memories of Canadian radio before the CBC. CBC Radio gambles and wins big on an innovative prime-time program. 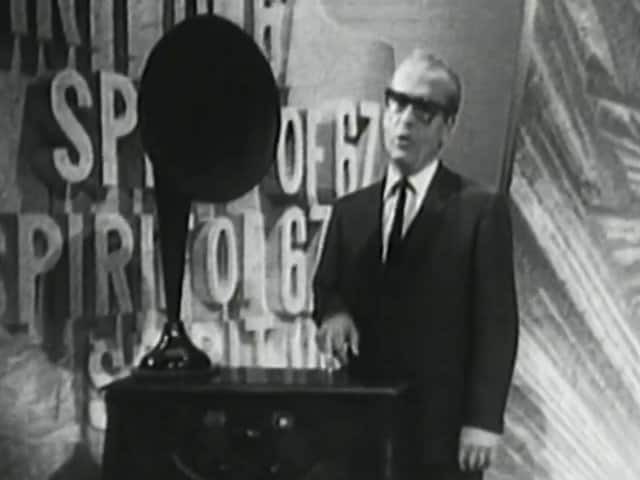 Quebec-born inventor Reginald Fessenden sang Christmas hymns in an early radio broadcast. During Canada's Centennial, CBC-TV looks back on radio's beginnings. Radio veterans recall the triumphs and challenges of broadcasting from the Royal Tour of King George VI and Queen Elizabeth. Public-radio champions Graham Spry and Alan Plaunt rouse support for a Canadian radio network. A CTV executive talks about the potential for competition with the CBC. New technology linking CBC stations means all Canadians can finally watch the same program at the same time. BBC, CBS and the United Nations congratulate CBC as Canada enters the television age. On September 8, 1952, CBC Television first flickers to life. A CBC Radio technician pioneers a method for capturing the sounds of the Blitz. Radio may be an international problem during the Second World War. Leonard Brockington, chairman of CBC, opens CBA radio outside Sackville. Canada sends out holiday greetings to the British Empire in 1932.